GM will close 5 North America plants, another three elsewhere. GM claims it does not see a downturn but will Slash Nearly 15,000 Jobs anyway. Four factories in the U.S. and one in Canada could be shuttered by the end of 2019 if the automaker and its unions don’t come up with an agreement to allocate more work to those facilities, GM said in a statement Monday. Plants without products include assembly plants in Detroit; Lordstown, Ohio; and Oshawa, Ontario. Also affected are transmission factories in Warren, Mich., as well as Baltimore. The salaried reductions amount to 15 percent of GM’s North American white-collar workforce of 54,000. The above articles only mentioned five plants. The BBC says GM Will Shutter Eight Plants. In February, the company said it would close one plant in South Korea. It also offered voluntary buyouts to up to 18,000 workers in October. The firm said it would name the two additional international plants set for closure later. GM sees an economic downturn or at least a car downturn and did so back in April when it stopped reporting monthly car sales. GM will stop making the Chevrolet Cruze, the Chevrolet Volt plug-in hybrid, and large sedans including the Chevrolet Impala, Buick LaCrosse and Cadillac CT6. 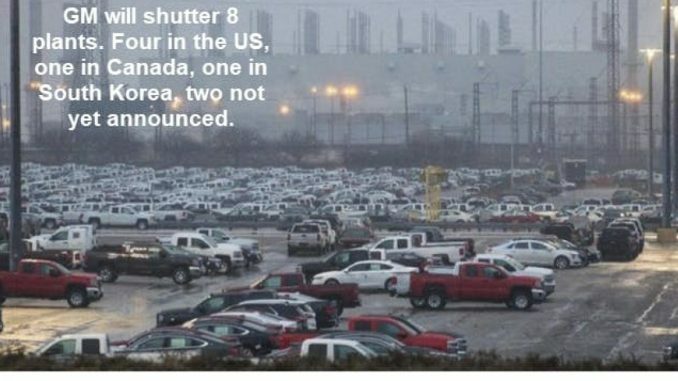 Also consider GM to Idle Factories, Cut Thousands of North American Jobs. GM said it would end production next year at three North American assembly plants and two smaller transmission factories, which combined employ more than 6,700 workers. Those include a factory in Lordstown, Ohio, where GM makes the Cruze; the Detroit-Hamtramck plant in the company’s hometown, where it makes the Volt and several large sedans; and a factory in Oshawa, Ontario, where such models as the Impala, the Cadillac XTS, the Chevy Silverado and the GMC Sierra pickup are made. GM, in October, said it would offer buyouts to about 18,000 salaried employees. Workers had until last week to decide whether to leave the company. GM wouldn’t disclose how many employees have accepted the buyout. The auto maker had about 180,000 employees world-wide at the end of 2017, including approximately 103,000 in the U.S., according to a regulatory filing. The United Auto Workers union, which represents employees at GM’s U.S. factories, said in an emailed statement that it will challenge GM’s decision through legal, contractual, and collective bargaining means. The group called GM’s decision “callous” and said the auto maker is putting profits above using American labor. The Auto Union is precisely one of GM’s problems. This is a business decision. It makes no sense to keep producing some car models at a loss. The union drove GM into bankruptcy once before and would do so again. Mike Shedlock / Mish is a registered investment advisor representative for SitkaPacific Capital Management. Mish also writes on economics in the world at Global Economic Analysis. He currently does fundraising to benefit ALS (Lou Gehrig’s Disease) research, which claimed the life of his wife of 27 years, JoAnne, in May of 2012. When not writing about stocks or the economy Mish spends a great deal of time on photography and in the garden. He has over 80 magazine and book cover credits. Some of my Wisconsin and gardening images can be seen at MichaelShedlock.com.